This soup mix recipe is one of the easiest jar recipes to assemble, using ingredients that you may already have in the pantry. Although you could use plain spiral pasta for this jar mix, the tricolor variety adds a lot of visual interest. As you can see from our photos, you can separate the three colors of pasta for a pretty layered look, or simply pour the tricolor spirals into the jar as they come from the package. Both versions look attractive when you add our free printable jar labels – one for the front of your jar, and a label of instructions for the back. Although I like this soup as it comes from the jar mix, you can add additional vegetables along with the canned tomatoes. Leftover peas and carrots, frozen french-style green beans or frozen corn would blend in beautifully. Serve this soup piping hot, with rounds of melba toast, crackers, or toasted garlic bread. Garnish with grated parmesan, if desired. Fill the rest of the jar with the tri-colored spiral pasta. Starting with the spices and ending with the pasta, layer the ingredients, in the order given, in a wide-mouthed 1-quart Mason jar. If you want a more formal look, separate the tri-color pasta and make a layer of each color. Print the jar labels provided on this page and glue in place, or make your own gift labels. Cover the top of the jar with a circle of fabric held in place with a rubber band. Cover the rubber band with a twist of raffia or a ribbon and small bow. 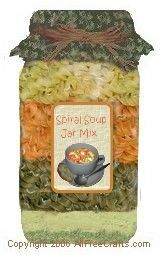 Print the Spiral Soup Label for the front of the jar, then print the Spiral Soup Directions label. Cut out both labels and glue to the jar.